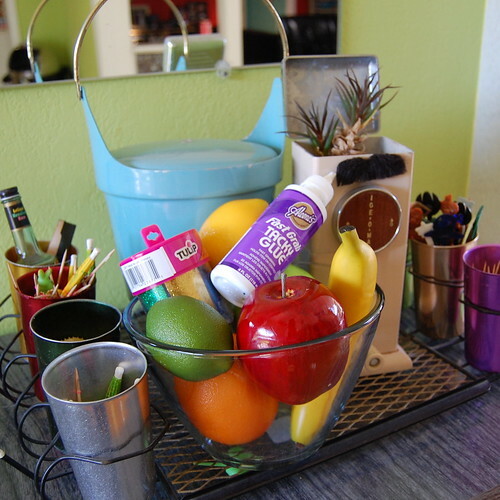 Nothing makes your kitchen look bright and perky like a bowl of fresh fruit. Once you eat the fruit, or your bananas start to turn brown and barfy the fruit looses it's charm quickly. 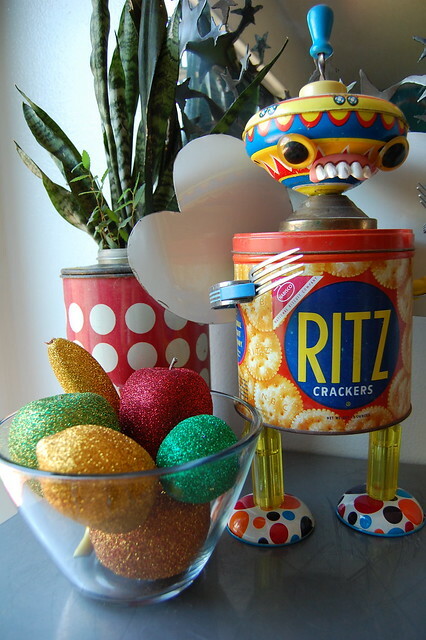 What if your fruit was bright, chipper & shimmery 365 days a year? Sound too good to be true? Grab your glitter for today's edition of I Love to Create and I'll show you how it's done. One of my 700 million collections is vintage beaded fruit. Apparently back in the day you could roll up to your local craft store and score some foam shaped like fruit. From there you added sequins and beads using tiny little pins. I can feel the pain in my fingers just thinking about it, so I needed a much quicker and less painful option. Then I had a glitter epiphany. After prepping my work station a bit I was ready. This project is pretty dang easy: paint, shake & wait. First, I painted the glue on each piece of fruit. 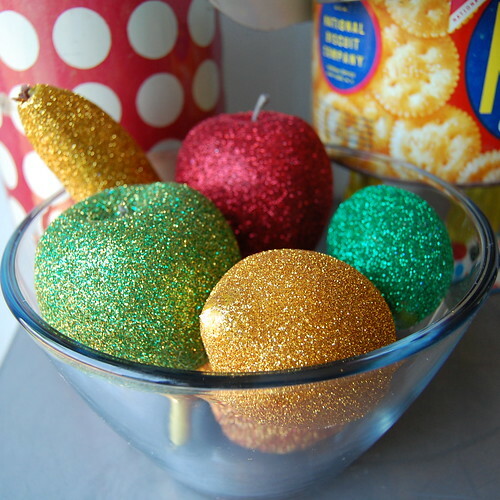 While the glue was still wet I sprinkled a thick coating of glitter on the fruit. 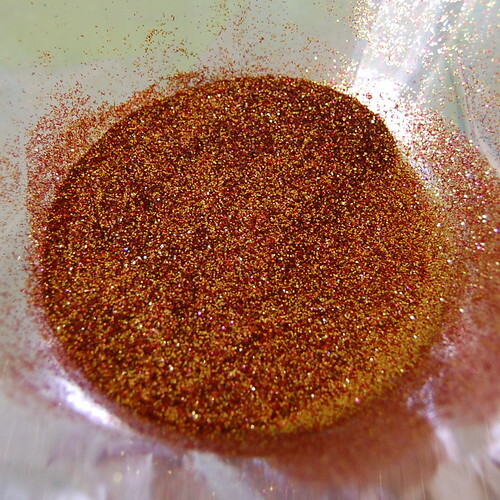 Shake off the excess glitter and set aside to dry. Sure glitter comes in orange and lime green, I just didn't happen to have any on hand and was too lazy to drive to the craft store to buy any. 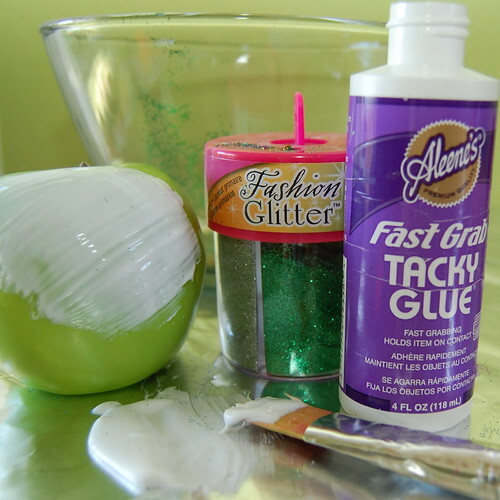 Just like you can mix paint to get any color you want, you can do the same with glitter. 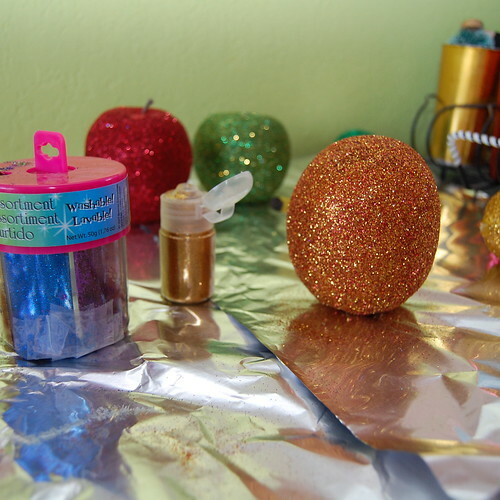 I glittered the red apple and shook off the excess glitter into a bowl. I then glittered the banana and the lemon and shook of the excess gold glitter into the same bowl. With a few tosses I had orange-ish glitter. I mixed gold and green to get the Granny Smith apple green. I j'dore the way the glittered fruit came out. 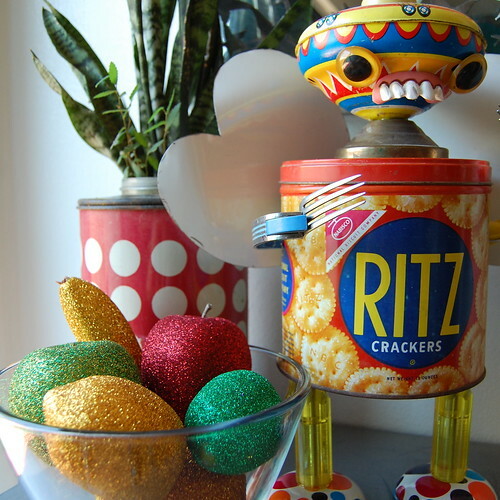 Same kitsch and perk as the beaded fruit, but with a lot less work. 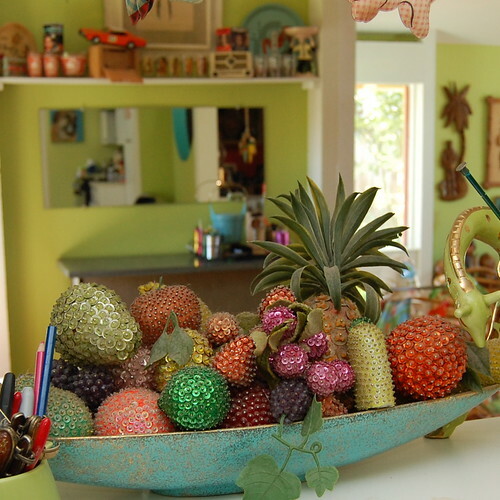 I might even let my new glitter fruit co-mingle in the bowl with my beaded fruit. i remember making sequin fruits back in the 60s or early 70s as a kid with my mom, it was truely painful sticking the sequins on with tiny little pins. my fingers would hurt for days afterwards, even using a thimble didn't help, because you couldn't pick up the next pin, or sequin...ouch just thinking about it. i found a bunch of those old fruits a couple of weeks ago, with the old christmas decoration, but they are dirty looking and the pins are rusty. i tried to clean one, but didnt get very far.